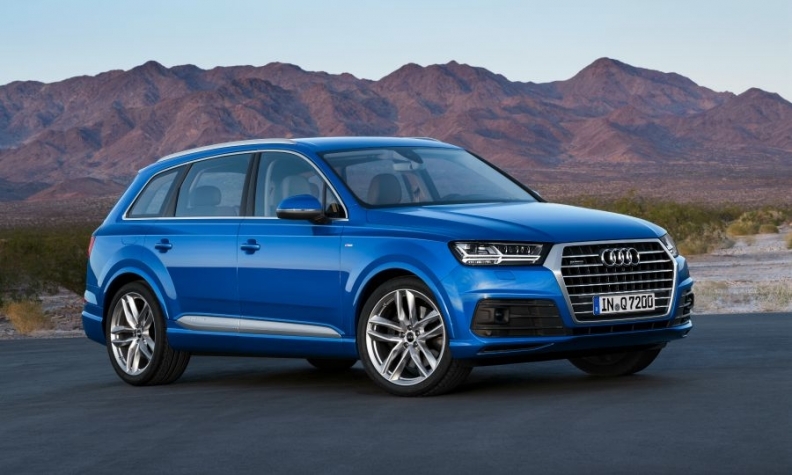 Audi's Q7, pictured, will be joined by the smaller Q2 and flagship Q8 in the brand's SUV lineup. FRANKFURT (Bloomberg) -- Audi is revving up its effort to topple BMW as the world’s top luxury-car brand with new SUVs ranging from the tiny Q2 to the full-size Q8. After falling to third place behind Mercedes-Benz last year, Audi is seeking to reignite flagging growth and overcome the emissions scandal that tarnished the image at parent company Volkswagen Group. Audi, which struggled last year because it had the oldest lineup among the three competitors, aims to regain an edge in 2016 by introducing new cars as BMW’s offerings age. Audi is presenting the urban-focused Q2 at the Geneva auto show next week. The SUV will become the brand's smallest crossover and is aimed at a younger audience. With the little Q2, Audi has zeroed in on a segment BMW and Mercedes haven’t touched. The car is designed to lure young city dwellers who require less space than in the larger Q3 sister model. Audi will also see its SUV plans tested as the revamped Q7 hit U.S. showrooms in January. The full-size SUV went on sale in Europe last summer. It will compete with the BMW X5, Mercedes-Benz GLE and newcomers such as the Maserati Levante in an increasingly crowded segment. Audi is VW Group's biggest earner and its success is crucial to fill the group’s coffers as the embattled automaker searches for its footing amid the six-month-old emissions-cheating scandal. Market leader BMW used SUVs to maintain dominance for a decade, and all three competitors have rushed to fill niches in the market. While Europewide deliveries of subcompact SUVs such as the Q2 will more than double to about 2.1 million units in the five years to 2022, Audi’s growth will still lag rivals, said Tim Urquhart, a London-based analyst with IHS Automotive. IHS estimates Audi will remain in third place through 2022 and end this year with a 1.2 percent sales gain to 1.83 million cars, slower growth than either BMW or Mercedes. In addition to the new models, Audi’s chances of upending that prediction hang on China, its biggest market. Car sales there will probably start growing robustly again, and Audi stands to benefit from the new version of its best-selling Q5 SUV set for a production start by the end of the year, said Sascha Gommel, a Frankfurt-based analyst for Commerzbank. “I expect Audi to start regaining some ground, in particular compared to BMW,” Gommel said. BMW has fewer new cars in the pipeline. It has also been unusually assertive in boosting U.S. deliveries by paying dealers to put new models in their service fleets, people familiar with the practice said this month. After rolling out the Q7, Q5 and Q2, Audi plans to introduce its first all-electric crossover in 2018, followed by a new full-size SUV dubbed the Q8 a year later. Also on the table is a higher-riding crossover version of the TT sports car. The strategy is key for the bottom line. Audi’s SUV buyers spend about two-thirds more on extra features than buyers of a comparable sedan, the company said. They’re also loyal. Two out of three Audi SUV customers buy another crossover as their next car. Protecting Audi’s sales and profits is vital as the VW Group faces billions of euros in costs triggered by its admission last September to cheating on emissions tests. Audi hasn’t been untouched, accounting for some 2.3 million of the diesel cars affected across the group. It also developed an engine that came under U.S. regulators’ scrutiny a few months after the scandal first broke. Talks in the U.S. are still going on, and Audi has remained tight-lipped about the anticipated financial impact.